Help with MS3 base tune - Miata Turbo Forum - Boost cars, acquire cats. I have a 94 NA C package that has all stock drive train. I have just built a MS3+MS3x that I wired using Westfield's very helpful giude. Though, I am still using the db37 connectors and will make my own version of DIYbob with a Tyco connector. I was able to flash the firmware onto the CPU and was also able to get Tuner studio to detect the ECU. Now, I am looking for a base tune for my miata to start the tuning process (the link on Westfield's website does not work). I would be grateful if any of you could provide a link for a 94 miata base tune. Initially, I plan to run with a narrowband as well as the stock IAT to iron out any issues with the ECU. I am looking to add a MTX-L sometime late December and maybe a GM IAT in January. Everyone is about to tell you to get a wideband. Good luck. How do you tune if you don't know what afr really is? I don't think you have a full understanding of the process. There is no base tune that will let you plug in and go without tuning. They stock iat is in the MAF which will be deleted when you run speed density (with a map sensor). So you need to add a GM IAT sensor so the megasquirt knows the air temp. This is the same reason you NEED a wideband. Any base tune you get will need to be tuned with a wideband. How do you intend on tuning your WOT cells (which require an AFR ratio of ~12.8:1) with a narrowband oxygen sensor that will only tell you "below stoich" or "above stoich"? Get a wideband. They are required. It's not an "add it later" thing, it's a "install it with the ECU and do not operate the vehicle without it" thing. Edit: I realize this doesn't actually help you find a base map. So I'll post Westfield's when I get back to my computer. It's outdated and will need to be looked over after firmware updates though. You can find one on DIYAutotune's website too. Google will help there. I should have a MTX-L wideband in a couple of weeks, which is fine as I will probably only have the ECU ready to go into the car this coming weekend. Initially, I will just try to install the ECU and work out stuff like making sure that the ECU is working fine, setting the spark timing, and getting the car to idle smoothly. 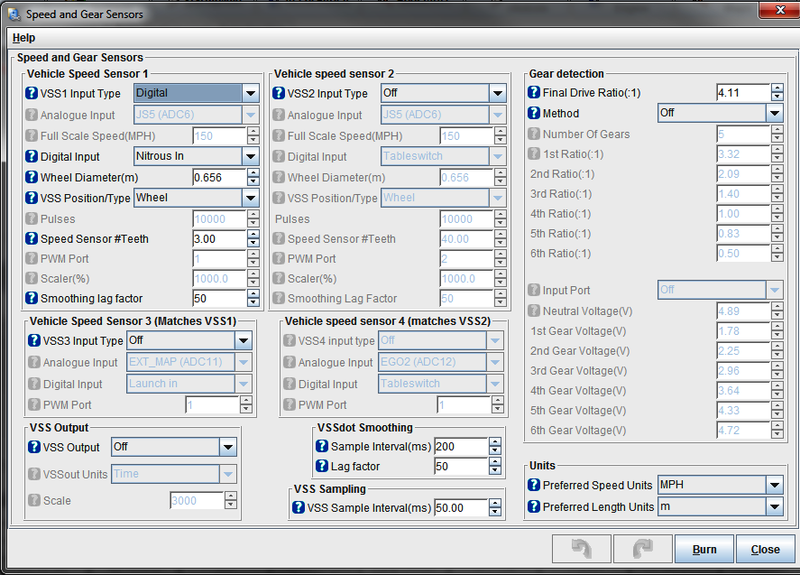 No driving, just something to make me comfortable with Tunerstudio before I get my hands on a wideband. At the moment, I am just looking for something that has correct settings for my car and the ECU. Maybe there is a way to use the dyypnp2 tunes present on the diyautotune website. I was under the impression that I will be able to use the stock IAT for now even though I have read that the MAF provides a lot of flow restriction. I plan on getting a GM open style IAT sometime in January only as performance is not my initial concern. Ultimately, I am looking to go turbo, so I am not too concerned with a slight loss in performance now. Just looking to master my MS3 before FI. Again, thanks a lot for your help in getting me initialized in the world of MS. I have read a bit about this but I am basically still a noob. You can use any of the 3.3.1 tunes on diys website. Make sure all your outputs are set correctly afterwards. Once again you need a wideband. You can't tune idle properly without one. Not sure if the Mazda AIT curve is available. But when you can get GM sensors for <10 dollars why would you not? Doesn't the ms3 kit come with one? Ok, I will dig into the 3.3.1 tune. DIYautotune does not list IAT as part of their kit. Looks like i should have ordered the IAT with the MS3. Anyways, I will get the IAT also with the wideband. At this point, an MSPNP Pro tune would be a better starting point for an MS3. Ok, the wideband is installed in a separate bung welded just before the cat. This way, I can run the stock ECU if there are any issues with the MS.
Building upon the MSPNP pro base map, I was able to get the car to idle fairly well. It idles at around 850 rpm and is as stable as it idles with the stock ECU. I am currently running it at around 13.5-14 AFR at idle with around 30kPa MAP. A/C idle up works very well. I can turn the A/C at it's highest setting plus all other stuff like the headlights, wipers etc. without stalling the car at idle. I also did a couple of short drives and the car drove fine. It is slightly sluggish than the stock ECU but that is expected as I have not done any significant amount of tuning. AFR stays around 14 to 15.5 most of the times but it does drop to between 11.5 and 12 under hard acceleration. The car takes a bit longer to start and I have to pump the gas pedal once or twice while cranking to get it started, but after that it idles and runs without any hiccups. Overall, I am very happy with how things have started and I guess the actual fun starts now. One issue I have is that MS is not reading my vehicle speed sensor. I am feeding the VSS to 'Nitrous In' input of MS3x and I got the attached settings from somewhere in this forum. I would appreciate if someone could cross-check the attached VSS settings for any wrong values. The VSS column has zeros in the log, so these settings are not working at all. Perhaps, the input type should be Analog. 2001 Miata on E85 with stock injectors?